3DS eShop title Mutant Mudds has proven to be extremely popular with Nintendo gamers, so much so that Renegade Kid, the game's developer, is bringing the game to the Wii U eShop in what is known as Mutant Mudds Deluxe. Yesterday we learnt that the new content in Mutant Mudds Deluxe would be exclusive to Wii U, and now even more Mudds related news has emerged. Renegade Kid's co-founder Jools Watsham has taken to Twitter once more to announce that a sequel to the game is confirmed. There's no official confirmation yet as to which systems the game will appear on, though the 3DS would surely be on the list due to the first game being such a success on the platform. What do you think of this news? 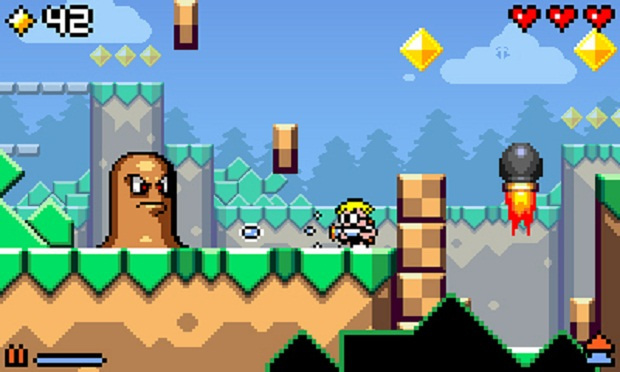 Are you happy to see a brand new Mutant Mudds title on the cards? Let us know in the comments below. Hopefully they price Mutant Mudds 2 better. I felt 9 bucks for the first was a bit expensive when I can get Mighty Switch Force for 6. He already confirmed MM2 was in development at least two months ago, maybe more. Cool, can't wait! It better have a run button or at least faster base speed and boss battles! Yep folks! I drained that bit of information out of him! Funny, first they threaten to stop supporting the system due to pirates; now this. I don't know whether to be excited, or annoyed. I'm all for Mutant Mudds 2, but I don't want to get my hopes up only to find out later it gets cancelled because they are too scared to lose sales due to pirates. What does everybody else think about this? Lots of Renegade Kid news this week huh? Good thing I bought Mutant Mudds with my Christmas money! I really need to get the original. I don't have any money wright now though. I did not really enjoy the demo so no interest from me. I need proper adventures on 3DS. I'm tired of all the tiny download games they do... Dementium? Moon? Please? ^ That's been confirmed, btw. Good news to me. I enjoyed the first quite a bit. I would assume it gets a release on the 3DS eShop, which is what I prefer because a game like this is perfect as a portable game. @KnightRider666 : What pirates? There's no pirates on 3DS? @KnightRider666 They didn't say this was for 3DS. Could be for Wii U for all we know. @Klunk23 dont do it, support a company that actually cares about their fans, and not just in it or the bucks, which i know is wierd to say bit who threatens their fans? Wow, a lot of people sure like making up things to be mad about. Threaten their fans? LOL. Yeah, I read that article. I still marvel that you translate those quotes as "threatening their fans" though. Again, people sure like making up things to be mad about. EDIT: Your Planet Crashers comments enlightens me a bit. Perhaps you just don't like Renegade Kid's games so now you've found a "legitimate" reason to dislike them. It's not a threat, it's a way of saying if you hackers hack the 3DS go to hell and forget about my games for your nice hacked console. Hopefully, it will come to PSN. RK doesn't need to limit their games to lame Nintendo devices. Didn't take long for people to ignore the game for piracy talk to vilify the developer for no reason. Oh well, miss out on a good game if you want. The first game was great, this should be better. Really liked the original and bonus levels. I wonder if the new game will play a bit differently. Just having new levels might not do it for me this time. Im going to pass, unless there is a significant difference between Part 1 and 2. But more of the same just will not do. We'll see. MM1 was great and shouldnt be missed. Still need to finish the first one, but can't wait for this sequel!! Why is everyone talking about Majora's Mask on a Mutant Mudds article? Lol! @SirQuincealot No they won't. They loved Scott Pilgrim vs. The World: The game. And that was a movie tie in game!! That's why they say there is no such thing as bad publicity. Yeah I think it was stupid he threatened us because of piracy. I personally think he was looking for someone to blame other than Lady Luck, and it made him sound like a baby. But I don't care as long as the games are good. Like Phil Fish is a clownshoe but I'm not going to deprive myself of Fez. @SirQuincealot Not true. Mega Man 9 had a multi-console release, plus the PS3 has a decent D-Pad unlike the X360. @Knux And that's why PushSquare is here. For you. To enjoy. As long as it fixes the flaws of the first (no bosses, jumps of faith) and it's for 3ds, then I'll gladly download this! I haven't played it too much, but it seems good enough to have a sequel. Of course, I better finish the first one first. I rather enjoyed Mutant Mudds. I would like to see some boss fights, though, or at least one notable variation to the formula. So, yeah. Whether this will be on the Wii U or (preferably) the 3DS, I'll buy the sequel. Yay. I still play the first when I'm out and about. @Knux ... Thankfully, I'm in a good mood. Spared. This was announced a while ago, but it's nice to see "we're still working on it". Unless it gets really bad reviews definetly getting it. Dingdongs like that aren't worth the time. Let them have something to make them feel 'cool' and I'll stick with my "lame" Nintendo device...except if I find another device that's worth buying, I'll buy it. I don't get the relationship status people develop with companies. I liked the 1st, but it wasn't as good as I expected it. I'd like more level variation, as in enemies, not just environments. Also, more abilities gained similar to power ups would be nice too. yes! I always liked Mutant Mudds, I'm excited for the 2nd one. They already confirmed this in the secret ending that came with those extra CGA levels. Did anybody else notice that Max was standing in a new environment? @Extremist, 3Dash, & SirQuincealot: I didn't mention any specific system. I wasn't thinking a boycott, I just think what they said was messed up; that's all. Great News!! I loved the original, and will certainly buy Deluxe and MM2. @rayword45 where is he going to comment on Pushsquare about this? Jools: "I'll not support Nintendo anymore...blaargh!" Jools: "ATV and Mudds 2 to 3DS and exclusive content for Mudds Wii U!" It will be interesting to see the improvements they've made from the first one. @EvisceratorX Hinting at a sequel in a previous game is hardly "confirming". @SirQuincealot That's nonsense. There are many retro-styled games on PSN. Sony will gladly take any games for the sake of money. They are not like they were in the days of the PS1. Example? Both Mega Man 9 and Mega Man 10 are on PSN. There's no harm in putting games on other platforms instead of limiting yourself to Nintendo devices when they don't even know how to do online properly. Having a game like this on the Vita or PS3 with trophies would be a god-send. Yes I love the original, can't wait for the Deluxe version and I surely look forward to the sequel as well. Awesome! I've yet to collect all the Granny Coins, but MM is my favourite eShop game. Can't wait! hm, he was just complaining about piracy fears for the 3DS and that they would stop producing anything for the 3DS, now just days later, we hear that mutant mudds 2 for 3DS is confirmed. go figure. Glad they've gotten pass the fears. For the sake of you and everyone around us (and my brain cells).